MySQL IF() takes three expressions and if the first expression is true, not zero and not NULL, it returns the second expression. Otherwise, it returns the third expression. Depending on the context in which it is used, it returns either numeric or string value. expr_true Returns when the condition is TRUE. a string when expr_true is a string, a floating-point value when expr _true is a floating-point value and an integer when expr _true is an integer. expr_false Returns when the condition is FALSE. a string when expr_false is a string, a floating-point value when expr _false is a floating-point value and an integer when expr _false is an integer. Note: There is an another IF statement, which differs from the IF() function described in MySQL procedure chapter. In the following statement, since 1 is less than 3, so the IF() returns the third expression, i.e. false. 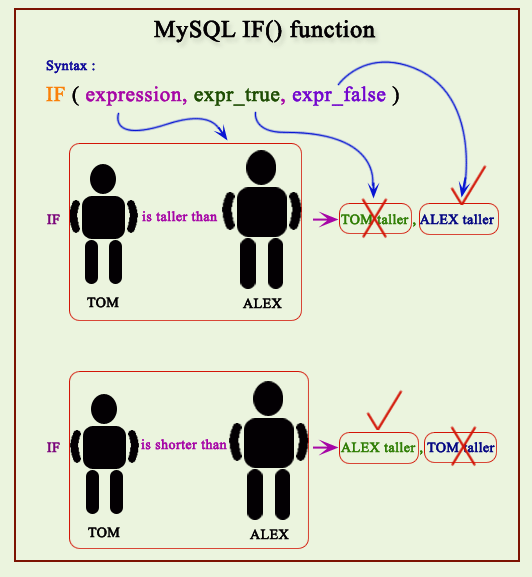 In the following example the MySQL statement returns the third expression 'false' since the first expression is not true. The following MySQL statement returns the book name and in which language the book have been published. The status of language is English Book for pub_lang English other wise it returns 'Other Language'. The following MySQL statement returns the book name, isbn no and a column alias Page/Price of an expression from the book_mast table. The Page/Price will be Price when the number of other language than English is more than the language English other wise the Page/Price will be Pages and no_page. Here in this example number of other language books is more than the number of English books . -> AS "Page / Price"
We can avoid displaying NULL in the output by using the IF function to return N/A instead of NULL. Here is query below. IF(pub_lang IS NULL,'N/A',pub_lang) AS "Pub. Language"
->        IF(pub_lang IS NULL,'N/A',pub_lang) AS "Pub. Language"
The following SQL statement will display the number of books purchase which publish by the language English and Non-English in a row. SUM(IF(pub_lang <> 'English',1,0)) AS "Non English"
->        SUM(IF(pub_lang <> 'English',1,0)) AS "Non English"
The following sql statement will display the number of publishers in a row for each country listed in publisher table.